Each morning, coffee in hand, Allen Koop sits in his chair before a fire and begins his work for the day. Invariably, the Dartmouth history professor and pastor glances up to see Dover artist William Mitchell's serigraph (screenprint) rendering of Mount Lafayette. It immediately re-connects Rev. Koop with his love for the White Mountains. The New London resident appreciates that many of Mitchell's brightly colored works portray places in the mountains of special beauty and meaning to him. "His work, more than anyone else perhaps, captures the color and light of New Hampshire," he said. "The best of our state is green, blue and white, with subtle shades of gray and brown. Bill's art captures this essence of the New Hampshire mountains, lakes and streams, and portrays a special place in a season in a way that brings light to the room." 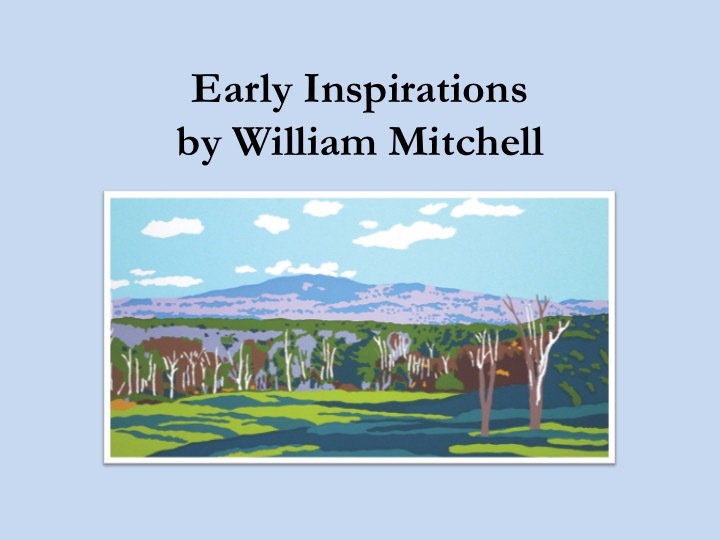 While Mitchell is not a Granite State native (he was born in Holyoke, Mass., and raised in Catskill, N.Y. along the Hudson) he speaks and creates with such passion about New Hampshire that he seems well on his way to becoming an honored adopted son. The printmaker's work has appeared on the cover of the guide to New Hampshire products and services, published by "New Hampshire Made," said Koop, "because he so nicely conveys the look of the state." He donated silkscreen prints for the 20th and 30th anniversaries of the spring auction of New Hampshire Public Television. In 1996, the Bank of New Hampshire commissioned his purple mountain "View From Indian Head" for use on its debit card. "It was kind of weird standing in line at the grocery store watching the person in front of me pay for their items with a piece of plastic decorated with my art," Mitchell said. "Many people told me they like the look of the card, so I guess at some level it was an artistic connection to the public." When Mitchell depicts a New Hampshire mountain scene, or a lake or river, the resulting image is both familiar and brand new, said Parker Potter, avid print collector and president of the League of New Hampshire Craftsmen. "I know the places he depicts, having hiked many of them, but they are all fresh and new when I see them through Bill's eyes," said Potter. 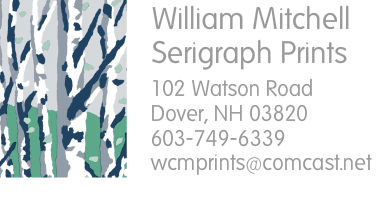 Those who buy Mitchell's work recognize his passion for his subject matter and respond to the clarity and beauty of his images, said fellow printmaker Nancy Davison, who owns BlueStocking in York Beach. "I respect his mastery of a difficult technique and the fact that he has been making serigraphs for a very long time." 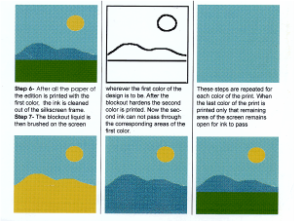 Serigraphy is a process of "squeegeeing" inks onto paper, by hand, through patiently prepared fabric screens. Mitchell, a digital pre-press graphic artist at the University of New Hampshire, described it as a marriage of emotions and technical ability. In its simplistic explanation, serigraphy is a process of printing with a stencil to create multiple images, Mitchell explained. Each color of a print is a different stencil. These stencils are carefully registered on the printing paper to create the full and final image. Mitchell said his enthusiasm for serigraphy as his primary artistic medium was born the first time he saw someone working on a silkscreen print. "I was engrossed in the process of pushing globs of ink through a fabric stencil and thus creating an image on a sheet of paper," he recalled. He found the process mysterious, yet totally direct in nature. "I couldn't wait to get my hands in it and, 26 years later, have not stopped yet." 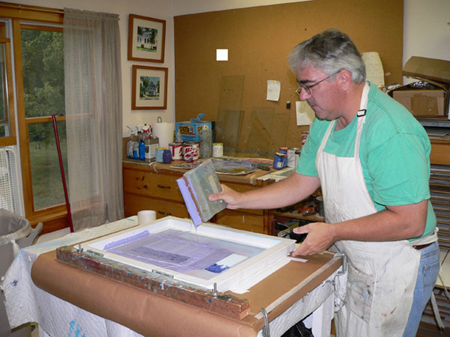 He also teaches adult and children's classes in printmaking, painting and cartooning. "I am interested in helping people explore and enjoy their creative potential," he explains. His New Hampshire Printmaking Project is an ongoing effort to introduce young people to several printmaking techniques. He uses their feelings and ideas about New Hampshire as a departure point in developing their imagery. The Project brings simple, hands-on techniques to students of all ages. A goal is to instill an appreciation for traditional printmaking techniques. "These skills are in danger of being lost as our culture continues forward in the computer age," he said. Mitchell has been conducting afterschool art classes and artist residencies for the last few years. He finds the experience rewarding. "I am continually amazed by the imaginations and talents of young people. I hope to inspire them to create with their hands and generate their own ideas," he said. Mitchell is reminded that there is much beauty in every state, including New York, where he grew up. So, what did he see in New Hampshire that particularly spoke to him, intrigued him to the extent that it has become his primary, if not sole, subject matter? "The scenic beauty of New Hampshire amazes me. How the rolling of a blue sky touches our rolling mountains to create a vibrant world. The intimate forest scenes, rushing streams and color everywhere are what inspire me. My paintings try to describe these scenes and bring order to a landscape that will never be organized and is joyful in its randomness." He hopes that people take an appreciation and an interest in preservation of our natural world from his art. "I hope my artwork conveys the spirit of our natural world. I am interested in describing my feeling for nature through my prints and paintings. I hope people are also able to explore their feelings about nature through my work." In addition, he wants to recapture a moment for people, to help them see what he saw, to experience what he experienced. Mitchell's artwork reflects his personality "It's open and accessible" said Janice Earley, manager of Exeter Fine Crafts, in Exeter. And his art, she added, reflects a profound awareness for the beauty of the area. "People are drawn to it because it gives them a deeper appreciation for what lies right outside their own back doors," Earley said. "He seems to see the world in beautiful, rich, clean colors," she said. Mitchell said he is interested in walking the line between the abstract and realistic in terms of style. Visitors to Exeter Fine Crafts are first attracted by the colors in his work, then discover a sense of recognition in the local scenes, Earley said. "I have heard the comment, 'Why I know that place! I've never looked it that way before.' "